Apple Seeking to License AirPlay for Video Streaming? Bloomberg reports that Apple is considering licensing its AirPlay technology to consumer electronics companies for integration into their products to enable users to stream video content directly to devices such as televisions. Such implementations would bypass the need for a separate set-top box like the Apple TV for streaming video from iOS devices to TVs. Under the plan, Apple would license its AirPlay software to consumer-electronics makers that could use it in devices for streaming movies, TV shows and other video content, said the people, who asked to remain anonymous because the plans havent been made public. Apple now only licenses AirPlay for streaming audio. Devices that could be used for video may be available this year, one of the people said. An expanded AirPlay would let users stream programming wirelessly from an Apple mobile device to a TV that carries the technology. That may spur wider use of Apples services and devices in consumers living rooms. Apple has already licensed AirPlay to consumer electronics companies such as Pioneer for the purposes of streaming audio from iOS devices directly to receivers and other home audio equipment, with Bloomberg noting that licensees pay Apple $4 for each AirPlay-enabled component sold. 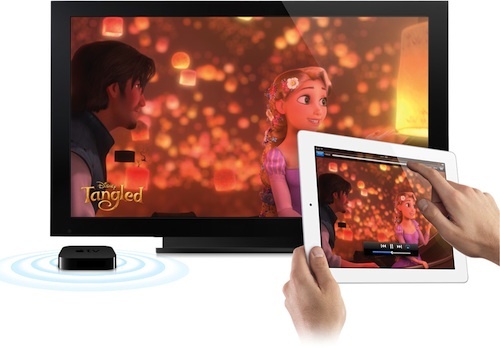 BridgeCo, Apple's partner for deploying AirPlay on a consumer electronics basis for audio, is also interested in video implementations, and an extension of AirPlay licensing to include video could be a major boon to television manufacturers and customers. At the same time, the move could bolster Apple's efforts to move both its products and its iTunes Store content into consumers' living rooms.